It's time for some realtalk about houseplants. I have a strange relationship with them: I've always had at least one (usually more) for the past, oh, ten years, but it hasn't always been by choice. You know, your parents come visit you at college and bring you...plants. "Oh, we were just at Ikea and these palms were on sale..." they'll say, or "These are from your grandmother's greenhouse and she grew them especially for you..." or "This old man who grows figs on some farm in the middle of nowhere New England cultivated this special black fig and here's his 20 pages of instructions for how to take care of it..." Okay so not quite, but you get the idea. And when your parents have driven 550 miles with their seats pulled all the way forward and themselves squished in to a small car just to accommodate the plants they're bringing you, you're not going to refuse them. Thus, houseplants have never seemed to me a choice but rather a fact of life. [caption id="" align="alignnone" width="375" caption="my little rittenhouse fig"] [/caption] I can't even tell you how many houseplants I've killed. Seriously, I've lost count. And we're not just talking delicate plants here: people, I've killed cacti. CACTI. You know, those things that grow in the desert? With hardly any water? Well, turns out if you forget to water anything for long enough, it will die. Luckily most cacti don't look too different whether they're dead or alive so I may be guilty of gluing a small fabric flower to a dead cactus to alleviate the pain. I don't recommend it, though, because the relief is short-lived. In this past year I've learned that I can indeed grow things. But growing a garden (even a garden of containers) outside is entirely different from growing things inside. Because outdoor plants are super easy. Outdoor plants always get what they need - sun and water. It may be cloudy one day but they still get sun, and it may not rain for a while but it will again. You know where it doesn't rain? Inside. And somehow I just forget to water plants that are inside. It's like I see them as some sort of furniture and just completely overlook the fact that they need watering. And then a week's gone by and oh! why is that plant turning brown? I'm trying to get better about not forgetting about my houseplants and I think it's working a bit but I've already killed one palm this year and another is getting preeeeetty close. One trick I've found is to put the plants in places that you look at often. This lovely little aloe is in the kitchen window, for instance: [caption id="" align="alignnone" width="375" caption="prickly little thing"] [/caption] The window this guy is in is conveniently next to the sink and dish drying rack (and right above where the cats are fed) so I'm sure to look at it at least once a day. Being near the sink also means it's super easy to water - just turn the faucet on to just over a drip and dribble the water in until it comes out the holes in the bottom. Fantastic! The only thing with plants in windows is that you need to remember to turn them once in a while unless you want them to grow towards the window, where the most sun is. You can see that this guy has lots of little new growth on the front left-hand side there; clearly that was the part closest to the window. After some trial and error with houseplants (don't worry guys, it only takes, like, 10 years) you'll start to find which plants work best for you. 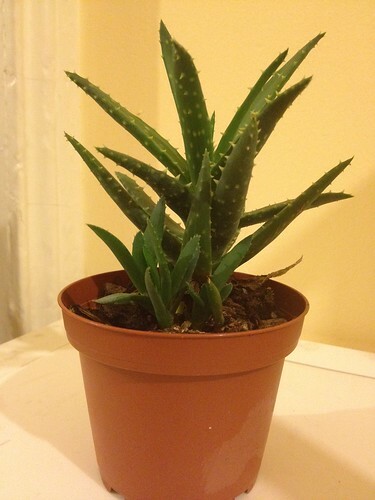 I seem to do well with succulents like aloe because they can get very dry without dying, and they're also used to large amounts of water at once, like in a desert. Other things, like palms (cough cough) are tough because the soil needs to be kept sufficiently damp and that means watering less each time but more frequently. Let me tell you: that is not how I roll. I find it very hard to water just a little - when I water I assume I won't be watering the next day so I tend to soak the plants a little more than I should, probably. This works out great in the garden in the summer because those plants need all the water they can get. But inside, plants don't need as much water and I've always found it hard to know when I was under- or overwatering until the plant starts to actually show signs of either, when it's usually too late. [caption id="" align="alignnone" width="375" caption="my other fig, with cats (for scale)"] [/caption] These figs that I've shown you pictures of are strange things, indeed. 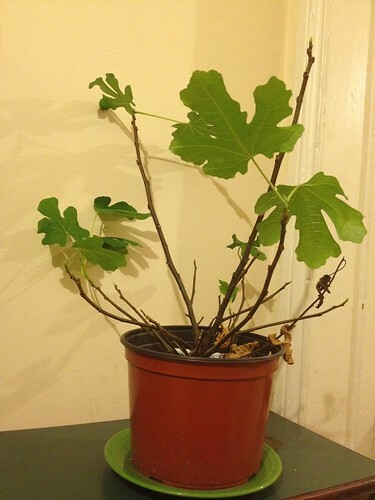 Allow me to tell you a story: Last winter, I had a fig. It was a special black fig and I may have referenced it above. It came with pages of directions, and to overwinter you were supposed to put it in a cool, dark place, let all the leaves fall off, and water only occasionally. This lets it do the plant equivalent of hibernating and then will begin to bud again in the spring, when you resume watering it and putting it in the sun like a regular plant. Like I said, watering is a problem of mine. And since the fig needed to be watered less than any other plant, I kind of forgot about it. But then spring came and there was a little green bud and I got excited! That is, until the bud dried up and fell off a few days later. That was the end of that fig. Then I got two new figs. The tall, skinny one is from that same fig-growing man in Massachusetts. The shorter, bushier one is from the farmer's market in Rittenhouse Square. I actually forgot about the whole hibernating for the winter thing, but the leaves started falling off both of them. I kept watering and kept them in the sun and soon new leaves started appearing! Now both figs have leaves and buds so I'm hoping I did this right. It's certainly more encouraging than the stick I was watering last year. The next thing about houseplants that I've learned is to have a good, big watering can. I used to water my plants with whatever was handy and clean - various pitchers work well for this. But they're all too small for the amount of plants I have now so I end up making multiple trips to the faucet, which in turn makes the act of watering that much longer. I will make any excuse I can not to water (the usual being that it takes too long even though it doesn't take that long) so having a big watering can that I can fill up once and water everything with is key. [caption id="" align="alignnone" width="375" caption="captain walker inspects"] [/caption] Another important thing about houseplants is that some are poisonous to humans and animals. And something that is safe for humans might be poisonous to animals and vice versa. So if you have small kids or pets that tend to eat things they shouldn't, you should make sure that all your houseplants are safe in case some do get eaten. We have two cats, one of whom, Mr. Hooper, will eat literally anything you put in front of her. When other cats sniff things to inspect them, she just eats them and then throws up later, if needed. The cat in the picture above, Walker, is very picky and will usually not eat random things. But the other night, Walker was in my room and I heard the sound of crunching on what sounded like a dry leaf...I look down and Walker is happily chewing a dead leaf from my rex begonia that is in my room for the winter. Of course I immediately freaked out and googled "are rex begonias poisonous to cats" (gotta love Google) and found, to my relief, that rex begonias are non-toxic to cats. Something that is toxic to cats is aloe, so my picture above should be used as a caution! But knowing Walker I knew that she just wanted to sniff, which is what she did. 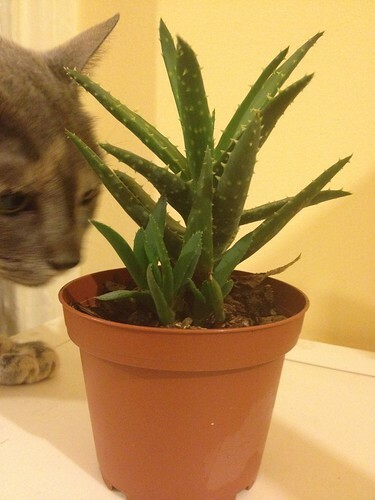 Also this particular aloe is very prickly so I don't think even Hooper, The Cat Who Eats Everything, would risk it. But just in case, it's on the kitchen windowsill where they can't get to. 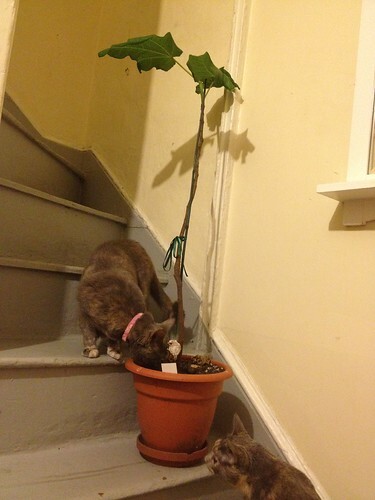 This is the only plant that I would risk doing that with because of the spikes and because Hooper can't jump that high; cats (and little kids) are really tricky and if they see a plant they want to eat they're going to get it one way or another. I guess the moral of this story (post) is that if you're always killing houseplants, don't immediately assume you can't grow anything cause houseplants are really hard. And if you can grow houseplants then good for you! Could you please share some tips?